More than seven billion gallons of fresh water are used every day to irrigate landscapes, and as much as 50 percent of the water is wasted from inefficient watering methods. Water is a precious and limited resource. The earth is a watery planet, yet only a small percentage of the water is available for human use. About 97% of the earth’s water is salty. Less than 3% of the earth’s water is fresh, and most of that is in the form of polar ice. Only about 0.003% of the freshwater on earth is accessible for human consumption. In less than 100 years, the world population has more than tripled, from 2 billion in 1927 to more than 7 billion today. Clean water is in short supply around the world, including the United States – 36 out of 50 states anticipate water shortages in the next decade. More than 7 billion gallons of freshwater are used in the U.S. every day to irrigate landscapes. 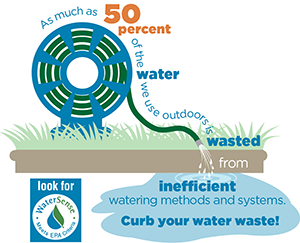 As much as 50% of the water used outdoors is wasted from inefficient watering methods and systems. This wasted water also contributes to water pollution. As excess water from inefficient watering runs off yards and down storm drains, it picks up fertilizers, pesticides, and other pollutants and carries them into local rivers, lakes, and bays. Plants need water, but not too much. Most plants will develop healthier root systems if the soil partially dries out between waterings. When normal rainfall is not enough, deep but infrequent watering is best, since it encourages roots to grow deeper, making the plant stronger and better able to survive periods of drought. Overwatering is the cause of many common plant problems. With the exception of plants adapted to wet soils, too much water can “drown” roots. Air spaces in soil provide the oxygen that roots need to grow and efficiently take in water and nutrients for the plant. When overwatering fills these air spaces, the stressed roots become susceptible to root rot and other diseases. Aboveground, wet leaves from too much overhead watering provide ideal conditions for the spread of harmful plant diseases. Here’s how you can grow healthier plants, conserve water, and save money on water bills! Healthy soil allows rain water to soak in and reduces the need for irrigation. Aerate any compacted soil in your yard – aeration will help get water into the ground and down to plant roots. Add composted organic matter (leaves, grass clippings, and other yard plant waste) to the soil. An easy way to add organic matter to a lawn is to leave grass clippings after you mow. Native plants also contribute to soil health – their deep roots open channels for both water and air to enter the soil. Learn more about keeping your soil healthy. Soil aeration leads to deeper root growth and healthier lawn areas. 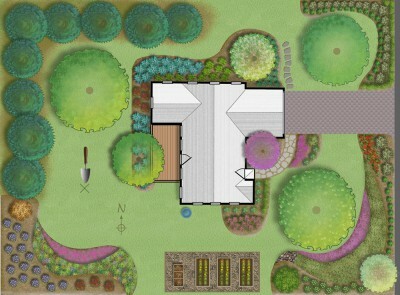 Choose plants with growing requirements that match the conditions in your yard. 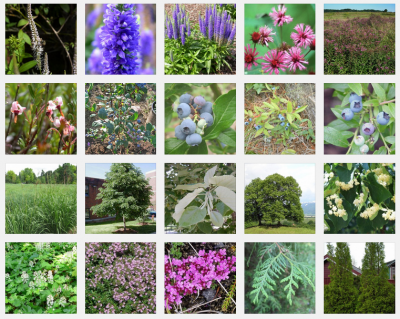 Native plants are best. Once established in the right place, native plants will thrive on normal rainfall and need little, if any, additional watering. Group plants according to watering needs. When plants with different requirements are mixed, some can end up being overwatered and others not watered enough. Save water and time by keeping plants with similar watering needs together. Minimize lawn watering needs by selecting grass species resistant to drought. Turf-type tall fescue species are a good choice, since they require little watering once established. Mow high – Rutgers recommends a mowing height of 2.5 to 3 inches for most cool season grasses. Keeping turf at the proper height shades grass roots and reduces evaporation of soil moisture. Mulch shades the soil and reduces evaporation, moderates soil temperatures, suppresses the growth of weeds (competitors for moisture), and prevents soil erosion. Mulch depth should be no more than 2 to 4 inches. Leave a space for air circulation between mulch and the base of trees and shrubs. Water only when needed and water deeply. How often and how much you water depends on many factors, including the soil and plant types in your yard and the weather. Watering on a strict schedule, without taking need into account, not only wastes water, but can result in unhealthy plants. Frequent light watering leads to shallow roots and weak plants which are more susceptible to drought and disease. Encourage plants to develop deep roots by watering thoroughly, but only when rainfall does not supply enough moisture to sustain plants. A general rule of thumb is that plants only need up to one inch of water a week, including rainfall. Use a simple rain gauge or a soil moisture probe to help determine when watering is needed. Time it right. The best time of day to water is in the early morning hours. To minimize loss of water through evaporation, avoid watering in the middle of the day when the sun is hottest or during windy conditions. 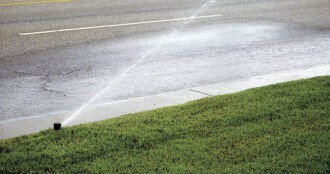 Fix irrigation systems to ensure that pavements are not watered. Use drip irrigation whenever possible. Drip (also called trickle) irrigation is more efficient and economical than overhead sprinkler systems. By slowly applying water directly to the root zone of plants, drip irrigation reduces runoff and evaporation. It also keeps above-ground plant parts drier, which reduces susceptibility to plant diseases that spread on wet vegetation. Maintain your irrigation system. Repair any leaks in faucets and hoses. If you have a conventional underground sprinkler system, regularly check for leaks in the lines and for broken or clogged heads. Make sure water is directed on planted areas and not on a driveway, sidewalk, or other hard surface. Use water-saving technologies. “Smart” technologies save water and money through automatic control of irrigation systems. Rain sensors help decrease water wasted in the landscape by turning off irrigation systems during rainy weather. Weather-based controllers use local weather data to determine when and how much to water. Soil moisture sensors activate irrigation only when soil moisture levels are too low. WaterSense, a US Environmental Protection Agency partnership program, provides information about these and other water-efficient products and services. Products with the WaterSense label are certified to meet certain EPA specifications for water efficiency. Most New Jersey homeowners use potable (drinking) water to irrigate their yards. The cost of treating and pumping this potable water to our homes is reflected in a water bill from the local utilities authority. There is a free resource ready to be used in every Jersey-Friendly Yard – rainwater! Instead of treating it as a waste product to direct away from the yard, capture it for use in your landscape. Passive rainwater collection. Rainwater is directed to a garden bed or other vegetated area for immediate use by plants. Rain gardens and vegetated bioswales are examples of passive collection. Directing roof gutter downspouts into planting beds or lawns instead of onto driveways is a simple way to harvest rainwater. Learn more about rain gardens. Active rainwater collection. Place a rain barrel or other container under a roof gutter downspout to collect a free supply of rainwater for future use. You can use it for everyday watering tasks or when you need it most – during dry periods. Rainwater is “soft water” containing no chlorine or minerals, which makes it ideal for watering plants. 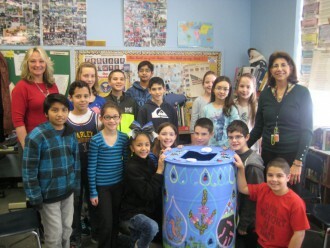 Learn more about rain barrels. Porous (permeable) pavement. Use porous surfaces when paving driveways, walkways, or patios. Options include gravel, pavers, crushed stone, and permeable asphalt or concrete.